How to Sell on eBay – For Beginners! These are all advanced techniques used by experienced power sellers on eBay, techniques that you can use to build and grow your own business. BUT – I get a lot of messages from people who aren’t yet at this stage. In fact, a lot of the requests for help that I receive are from people who really are just starting out. They don’t have any ideas yet and really; they just don’t know much about eBay at all. So I’ve decided to write this guide for those people – a complete newbie’s guide to getting started on eBay, and in it I’ll cover things like opening an account, listing your first item and everything else you need to know to get started on eBay. A step by step walkthrough that will take you from not knowing anything about eBay to having a great foundation that you can build on! First things first – before you can do anything on eBay, you need to open an account (obviously!). This couldn’t be any simpler and most people will already have their own personal account anyway from buying things (if that’s the case, then you just need to upgrade it to a Business account). So simply go to eBay’s homepage and from the top left, click on register. You’ll be taken to a registration page but don’t bother filling in those details as you need to instead click on “start a business account”. That takes you to another page that asks for some details about you and your business. It’s all extremely simple and really the only thing needed other than your personal information is Business Name and Business Type. Business Name is self-explanatory – you just enter the name of your business. If you’re a sole trader, you do still have to enter a business name and it doesn’t have to be a Ltd company, so that’s not a problem! IMPORTANT – Ideally you want to choose a business name that has an available .co.uk & .com domain. Even if you have no plans to open an online shop at this point (in fact – I wouldn’t even suggest doing so until your eBay business is up and running, read more about my thoughts on this here: https://andrewminalto.com/ebay-vs-amazon-vs-online-shop) you should still have this in mind as a future goal. Plus, even without an online shop, you still need a domain for a customised email address for your eBay business as well as for hosting your product pictures (more on that later!). So, before you register a business name with eBay, check to make sure that the domain is also available. You can do that on any number of domain registrar sites online, such as Go Daddy or Namecheap. If you’re having a lot of trouble coming up with a good name for your business – check out this guide I wrote on how to find the perfect domain name. And then for Business Type; for 99% of people it will simply be Retailer. Then just click continue and the rest of the information that eBay asks for is pretty standard and self-explanatory so no need to go through it here. Just one small thing to mention, you also need to register an eBay ID, which is basically your username. Although it doesn’t really matter, it’s always best to choose something that ties in with your business name and branding, rather than just “john1234”. 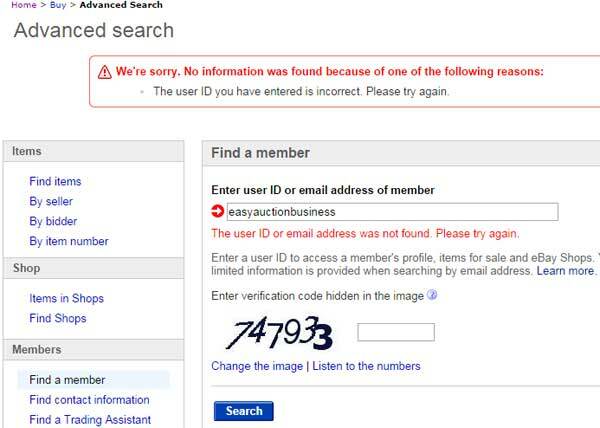 To check if the username you’re thinking of using is already taken, just head to eBay’s homepage and select “Advanced” search which is to the right of the main search button. Then click on “Find a member” and search the name you’re planning to use. Just for an example, let’s say I am starting a new eBay business called Easy Auction Business, so I search the user ID easyauctionbusiness (no spaces) to see if the name is already taken. So once all this is done, that means you now have an eBay account. Congratulations! But you also need a PayPal account to go with this. This is 100% needed as there is really no way to sell on eBay without a PayPal account. Once again, many of you will already have an account from personal use. If so then all you need to do is upgrade it from a personal account to a premier account. You don’t have to pay to do this and there are no ongoing subscription fees, usually you just need to go through a few extra verification steps to allow you to receive debit and credit card payments via PayPal. If you don’t yet have a PayPal account, then just head over to their site and create one now. Again, it doesn’t cost you anything and is a very simple process – there are a few things that PayPal go through to verify your identity and address but altogether, the whole process should take no more than a few days. You have one PayPal account (under your main email address) and then you create an eBay account (usually under a new email address specifically for your business). Then to tie them together, all you have to do is add that eBay email address to your PayPal account. It’s as easy as that! That way you can easily separate your personal and business transactions and it looks a lot more professional to your buyers when you have a dedicated email address for accepting payments for your business. Then all you do is enter the email and verify it, and it’s successfully tied in with your PayPal account and can be used to take payments on eBay! You have one main PayPal account which you can then link multiple eBay accounts to (all under different email addresses). And that’s it! So simple and easy, yet it’s something that causes a lot of confusion, mainly due to all the misinformation out there online! Once the initial account set up is taken care of and you have your eBay account linked to PayPal, it must be time to start selling!? Well, not so fast! You’re nearly ready to list your first item but there are still a few things that you need to take care of. The main one being – feedback. Feedback is incredibly important on eBay! After all, if there are two sellers for one item, identical in every way (price, postage, listing, product pictures etc.) other than their feedback – who would you (and the majority of buyers on eBay) choose? Most likely, the seller with the most feedback! It’s common sense really and it basically boils down to a seller with high feedback being more trustworthy in buyers’ eyes. So what does this mean? That you can never get started on eBay because you don’t have any feedback? No, not at all! It just means you have to be a little bit smarter when starting off, and that entails doing some preliminary feedback building BEFORE you start listing items for sale. Now the easiest way to do this is by BUYING on eBay. All you need to do is purchase 10-15 items so you get positive feedback from those sellers. Once you’ve purchased everything you need, you should have at least 5-10 feedbacks from sellers but if not, the easiest way to make up the difference is by buying really cheap items, things that cost £1 or less with free shipping. I just bought this item from you and was hoping you could please leave me positive feedback for the purchase. Do this after you have left feedback for the seller of course. That’s it! And 99.9% of sellers will leave you feedback if you send them a quick message like this. Altogether this process shouldn’t cost you any more than £10 (after all, the packing materials are needed anyway) but it will make a huge difference when you start selling. Please don’t just skip this step out, thinking that 0 feedback and 10 feedback really isn’t any different, as in buyers’ eyes the difference is HUGE. Okay, so at this point you now have an eBay account with at least 10 positive feedback and are ready to start selling! What I recommend you do now is gather items from your house that you can list on eBay. This is a great way to get started without risking any money and in fact, you can actually build up a good amount of money with this method, which can be put towards buying stock later on. If for whatever reason you don’t have any items from around your home to sell, then I’d recommend using the ever popular Used Goods concept to buy and sell your first items on eBay. You do need some money to get started with this, but £50 is more than enough and once again, the risk is minimal anyway. Basically this concept involves buying used goods and then reselling them on eBay for a profit! 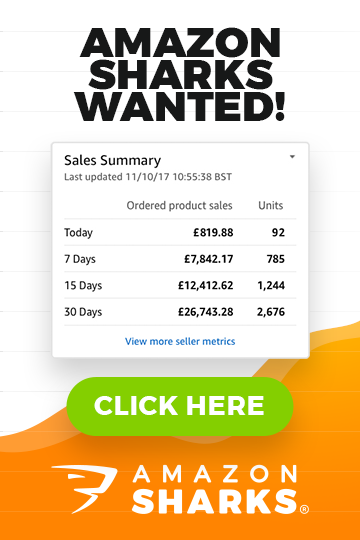 It’s an incredibly simple business model that’s great for newbies which you can read more about here: How to Start a Profitable eBay Business With £50! Okay so you’ve either gathered goods from your home or have bought something to resell and now you need to take some product pictures for your eBay listing. One of the keys to selling on eBay and getting a high amount for all your items is by creating proper and professional eBay listings and step 1 for this is taking great product pictures. The more detail you can show of your item, the more likely people who view your listings on eBay are to make a bid. It’s as simple as that. After you’ve created great product pictures for the item you’re going to list, you need to get them ready for your listing, and this goes back to the domain and hosting that I mentioned earlier. eBay does now offer to host 12 of your product pictures for each listing and while this is an okay option, and you may to choose to go with this for your first few listings, I still always recommend the more advanced option of storing your pictures on your own hosting account. While it may be more difficult initially, it gives you a greater level of control and once you have a system in place, it isn’t actually any more time consuming than using eBay directly. Creating Your First Ever eBay Listing! Yep, that’s right – you’re now ready to create your first ever eBay listing! Congratulations for making it this far! It may have seemed like a lot of work, but it is 100 times better to get all of this right this first time around. 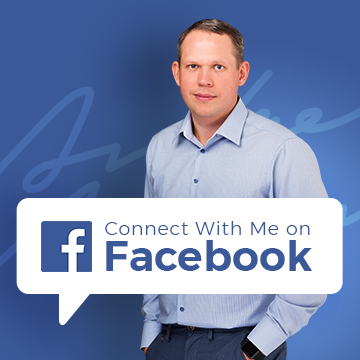 You now have a scalable system in place that you can use to actually grow your business! As I briefly mentioned above, how you present the item you’re selling is of paramount importance when selling on eBay and the ONLY way to create beautiful and professional looking eBay listings that really SELL your items is with a template. You can either order a custom made template (this will cost you at least a few hundred pounds) or you can find some free ones online. A perfect starting point for this is my very own Spicy Auction Templates where you can get 10 great looking templates for free or get access to the entire library of 800+ professional templates for less than £30. So once you have your template, the actual listing creation process is very simple (each new listing will take just a few minutes once you get the hang of it). I don’t recommend creating your listings on eBay itself as while that may be okay for just one or two listings, anything more than that and it just becomes too time consuming. Instead I recommend you use Turbo Lister. There are countless listing tools out there, but Turbo Lister is the official one made by eBay and in my opinion it’s the best and easiest way to create and manage your eBay listings, unless you use a more sophisticated system like Linnworks. But for most people, and especially when just starting out, Turbo Lister is just fine so that’s what I recommend you use for now. Turbo Lister is completely free so you can simply head here to download it. And that’s it! You’ve created your first eBay listing, which should now be live. If everything is fine, your listing should show up under Active Selling with the end time matching up to however long you chose the auction to run for. Now all that’s left to do is wait for the listing to end and see who wins your item! Okay so I’ve come back to the listing and the item has sold for £16.00, hurray! The buyer has already paid for it (as remember with an auction, payment isn’t taken automatically and the winning bidder has to come back to the item and pay for it) so it’s time to get it posted. What service you use to post the item will depend on the size, value, etc. but basically it’s usually between Royal Mail and the various couriers (such as Hermes, Yodel, ParcelForce etc.). 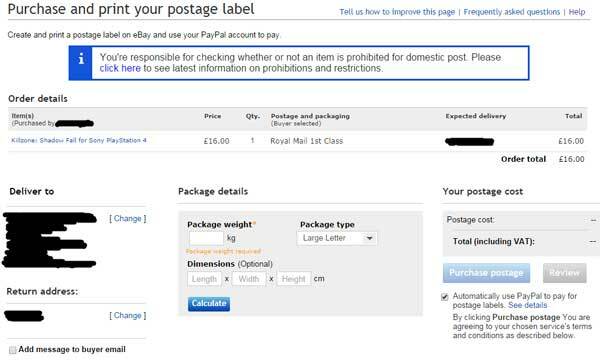 You can read about the pros and cons of each one here: The Ultimate Guide to Shipping for eBay Sellers but to simplify it hugely; Royal Mail is usually the best choice for smaller, lightweight items and couriers the choice for bigger, bulkier ones. In my example, the item is small so RM will be the cheaper and quicker option. …or simply head down to your local post office and pay for it there – that’s up to you really. Once you’ve sent the item off to the winning bidder, you should come back to your eBay account and mark is as dispatched so that your buyer doesn’t get worried and think you still haven’t posted it. Then the next step is to leave positive feedback for your buyer. You can’t leave negative feedback for a buyer anyway, so what’s the point in delaying it. And that’s it! Once you’ve posted the item and left feedback for your buyer, there’s really nothing left for you to do apart from wait for the item to be received and to (hopefully!) get feedback left for you as well. Then it’s simply a matter of rinse and repeat! You either list more items from your house or repeat the process using the Used Goods concept. Whichever method you use, you’ll gain experience and feedback all while making money and proving to eBay that you’re a trustworthy seller – which will mean that they increase your selling allowances. After doing this for a little while you can move onto some more advanced eBay tactics and can look to make a real business out of it! Please, please do not ignore any steps in this process or skip ahead to buying large quantities of stock to resell! That will nearly always end in disaster and it’s simply not the right approach to building a profitable eBay business. It’s all about taking little steps, bit by bit, while creating a long term system. Then you can build on what you know and your experience to push yourself and your business to the next level. You can simply stick around this blog and learn everything there is to know, or better yet; join my hugely popular eBay training program – Easy Auction Business. 3.0 is the brand new version, created from scratch for 2014 and it is, in my opinion, quite simply the best and most comprehensive eBay training program out there, that will take you from a complete beginner to Power Seller in no time at all! But for now, get started with everything that I’ve gone through in this guide. Remember, you won’t see any results without taking action and while it can feel very daunting when you’re just starting out, I have provided you with everything that you need! And if there is anything that you don’t understand or need more help with, then simply post below and I’ll answer you personally. I look forward to hearing your success stories ;-). Many people sell products on eBay they have sourced from wholesalers, liquidators, clearance stockists, importing from China etc. Used goods is only part of eBay, most people deal with brand new items. What are advantages and disadvantages of registrating business account? If I only begin my way of ebay seller is it crucial for me to have a business account or I can use the regular one, while selling old staff from my home? You can definitely start with personal account. But you can’t get TRS status with personal account so at one stage, when you have sold 100 items worth more than £1k, you’ll want to upgrade to Business account, to get that TRS status. I have a quick question about my ebay account and paypal account. i have been with ebay since 2009 with personal account. in this month i changed my ebay account to business account. now i want to open a new business bank account. how can i link to my ebay account to my new bank account. how can i register as a business account with paypal. You simply upgrade your PayPal account to Business account and add your new bank account there, that’s it. and 2nd do i need a new email address for that. No need for new email and any bank account will work ok. I have a quick question about marking an item as despatched. I live in the ‘sticks’ and the last collection from the local Post Office is 12.30 on a Saturday. If a buyer purchases an item at 1pm on Saturday, even though I’m on it straight away and the item is ready to go by 1.30, it’s not going to be collected until Monday with delivery on Tuesday (if I use first class post – I do!). If I mark it as despatched straight away, that will raise the buyers expectation that they will receive it on Monday, but if I mark it as despatched on Monday morning, that will look like I can’t be bothered to fulfil their order, but it manages their expectation on delivery. I have adopted the latter approach leaving it until Monday morning to mark it as despached, but as an experienced ebayer, which approach would you recommend? I would do the same – mark it as dispatched on Monday morning. Most people don’t expect orders to be processed over the weekend, so you should be fine. Thank you very much for your generous and awesome effort to help newbies. I am a big fan of your blog and ultimately this has became my hand book. I’m still in very early stage to start an eBay store and planning to buy your EAB as well. 1) Can you sell anything having an “eBay Store”? 2) Do you have included in EAB regarding eBay Store? 3) Why do you recommend to have a PayPal account with a personal email address? Is it professional enough to do so? I am waiting to hear you soon. 2) Yes, of course – I cover eBay shops in my Easy Auction Business course too, they’re important part of any eBay business. 3) Sorry, not sure what you mean by that? I read your informat ions in your web-site.And It was very usefull to me to understand how ebay works.But I have few questions, if you can answer them, It would be great for me. 1- I opened an ebay and paypal account. I began to buy some products to get some positive feedback.In order to understand the process, I wanted to put a product for selling. And I wanted to use Turbolister programme.I downloaded it also.But in the programme I realized that I should establish a domain name for hosting pictures.Should I need to do that ? I opened my ebay account as a personal user not as a company.Without making this , can we use TurboLister ? Please give me some information about this. 2- Secondly, when we are putting our product for selling , we should choose the selling format.How can we do it, for example if we dont want to sell in an auction, instead of it we want to sell it as “buy it now” option? Or both options should be together ? 1. You can still use Turbo Lister without eBay business account, that’s fine. For images – yes, get a hosting account to make most out of Turbo Lister so you can insert product images directly inside listing description/template. 2. You can set listing type directly in Turbo Lister, for each listing separately.